Discussion in 'California & Hawaii' started by Calmar, Apr 1, 2010. Trek and Gary Fisher are bringing their newest creations to Saratoga Gap OSP on Sunday April 11th. This is your chance to take a real ride on their line of road and mountain bikes. We'll have everything from 29ers to freeride bikes to road bikes. Plus there will be a Di2 bike to ride. We're also providing food and beverages to those who show up. 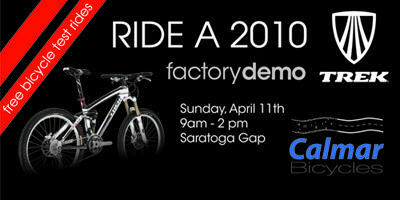 Why: Buy the model of bike you test rode before 4/18/10 and receive a $100 gift card. Fuel EX 9.8 '09: 15. If you want to ride a specific size of a specific bike, please note that these bikes are being used regularly and, occasionally, a few go out of service. This list is only current as of 3/23. Sorry guys but the demo is cancelled. There's no consistent data coverage at the top of 9 or I would have posted sooner. It started dumping rain at 9:10. We're arranging a Customer Appreciation night for Tuesday the 20th. We're going to go for a ride likely at Santa Teresa park. I'll post details in a new thread as we finalize it.